O Xangô de Baker Street is a Brazilian movie released on 26 octobre 2001, produced by Sky Light Cinema Foto e Art Ltd. and distributed by Columbia TriStar Films, starring Joaquim de Almeida as Sherlock Holmes and Anthony O'Donnell as Dr. Watson. 120 min. The plot is based on the Jô Soares' novel : O Xango de Baker Street or A Samba for Sherlock (1995). Jo Soares appears in the movie, briefly as a judge. The movie has been shot during 12 weeks in London, Rio de Janeiro and in Portugal. 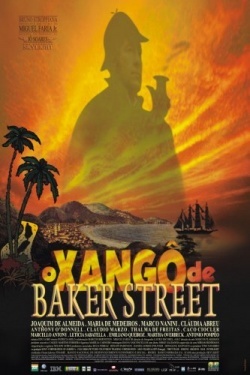 Other title: The Xango from Baker Street (International). Director : Miguel Faria Jr.